Discussion in 'Cooking Knife Reviews' started by Pirvan Lucian, Mar 19, 2019. Hello everyone,this is my first post around but i've been following ChefTalk for some time. Have some questions about a knife acquisition.This month Zwilling made a sell on a Professional S 8" Chef knife,50% off.It's a bit under 60$.I really want to buy it.What do you think?Is it worth the price.How is the blade on Pro S?I want to buy a Whetstone Sharpening kit of some sort.Some recommandations lead me to a Sharp Pebble 1000/6000 kit for a begginer in Sharpening Knives.Is it a good match with the knife? What country are you in? Cutlery availability is significantly affected by national location, and we have inquiries from many areas around the world. I will admit that I'm not a fan of Zwilling, and so before I (or anyone else) can seriously comment on alternatives (or about sharpening stones), we need to figure out what is available in your area. Also, if you're a professional, then I would not recommend anything as short as 8 inches (a little less than 20cm). I think you would be much better served using a blade in the 240mm to 270mm length. The Zwilling Pro S has a full bolster, including a fat fingerguard. It hinders proper sharpening and hides the heel, which is otherwise very useful. If it has to be that kind of Zwilling, the Pro comes without the fingerguard reaching up to the edge. Now about Zwillings in general: fat, heavy and soft. Fool proof. The only reason this soft steel has been chosen. The profile is fine for very tall people rock chopping on far to low a board. Otherwise, the high tip can't be used without elevating your elbow above your shoulder. 8" is a bit short. No fun with cabbage or celeriac. If it has to be a soft stainless German, consider one specific Wüsthof, the 4581, from the former Cordon Bleu series, perhaps as a 23cm. Lighter, with a lower tip and no fingerguard. Same Krupp 4116 as the Zwilling. But any reason why it should be stainless, soft stainless, have a German profile? Those 50% off are just a fraud. Nobody sells this knife at US$120. About sharpening: this type of steel can be polished, but it will weaken it considerably. If you want to enjoy at least some edge retention sharpen at 400 and strop and deburr very lightly at 800 or so. Keep it rough and it may serve you somewhat. I'm from Romania.This knife will be a replacement for my IKEA CHEF KNIFE.It's a decent X50CrMoV15 for 20$ but want an upgrade.Been reaching other forums.In the future i might be buying a Japanease one. My eyes right now are on a Tojiro DP 210mm.Found an importer and the price is 80$.So the upgrade from IKEA to Zwilling will be worth it especially with 50% off. And on the Sharpening Amazon UK is my place.I've been looking at Burrfection for a long time and that Sharp Pebble is a good entry level stone,but WILL IT BE ON MATCH WITH THE ZWILLING PRO S? Actually right here these are the prices during the year.It's not that I'm more into Zwilling.My only previous experience was a Twin Pollux at the place I worked and I liked it.I was in my first steps on knives though.This one,the Zwilling Pro S I want to buy will be in my home kitchen that's why I didn't went up to a 9" or more.My IKEA will be the one that handles large root vegetables or so. So....Should i go with the Pro S at 57 USD 50% OFF or invest more in other one? I really wish knives would be more reachable here or at least Amazon being able to send to Romania(knives are currently not being sent to here).Don't know if i mentioned that it'll be a knife used at home. Is the Friodur better to be sharpened at that 400-800 range and not worth taking it higher into like 4000-6000 grit? They send everywhere in the Union, and beyond. Krupp's 4116 contains large carbides in a soft matrix. Fine stones leave the hard carbides as they are, but weaken the soft matrix even more. This leads to poor edge stability. I agree with benuser about the 4116 steel (which is the same as "X50CrMoV15"). There isn't much difference between Zwilling's "proprietary" steel and 4116 steel. That steel is mostly chosen by manufacturers because it's a very tough steel and resists chipping. That means there won't be so much need for sellers/dealers to deal with broken and chipped edges. The downside is that it's also a somewhat soft steel that will resist abrasion (meaning it's difficult to sharpen) and it's not going to hold a good polish on the edge you do manage to finish sharpening it with. Bottom line in comparing your present IKEA blade with the Zwilling: After sharpening, I don't think there will be that much difference (if any) in the cutting performance between the two knives. For a better alternative in the 210mm length (if you absolutely must use that length), then try a MAC HB-85 gyuto. European prices can be found at around 75 euros. But for a 255mm length (much more practical), I would suggest a MAC BK-100 gyuto, with a price range around 119 euros. Of course, I can't speak about taxes and shipping costs - you will have to independently research that. That Fibrox is at the top of inexpensive restaurant knives, nice profile and thin grind. The Wusttof Pro is in the same category but more German in profile, though I've heard it has harder steel . Both are made of that same Krupp's 4116. About the Victorinox Fibrox: I wouldn't call it thin where it matters: right behind the edge. With good knives, figures are 0.2mm above the edge, 0.5mm at 5mm. Here that 0.5mm thickness is already reached at 2.5mm. First thing I do with new ones is flattening the shoulder: that's where bevel and face meet. The MAC BK-100 is an excellent suggestion. My 10" vic chefs (same blade as the fibrox) was just 0.3-.35 at the edge. For a cheap 10" chefs I personally haven't found anything I'd prefer over it. The Article essentially only says and edge should be allowed to get no thicker than 0.6. 0.4 is likely the top range that Vic/Fibrox ship knives. I had an easy time bringing it to .25, as thin as you should go with the steel's temper of around 56RC. BTW, I believe the Vic/Fibrox use the same steel as the Swiss Army knives, which is 1.4110/4110. Anyway, what sub $50 chef knives are going to be thinner than 0.6 at the edge? The only one I've found is the Vic, and the iHomeer I recently spoke of, which ran .25-.028. All Wusty and Henkles are all typically over 0.6, yes? And the Cordon Bleu is very expensive in comparison. The 9" chefs is $165 on Amazon US! The Vic/Fibrox has the height, edge profile and thinness (in my experience) though the handles are too bulbous at the front choil/front end, but that is easily fixed to your liking with a little electric hand grinder. Your experience with 0.35 at the edge coincides very well with where the 0.5mm are reached: at 2.5mm towards the spine according to Victorinox, at 5mm with thin knives. For thin and unexpensive, go carbon. Robert Herder. That being said, I do like the Vics for their value and no-nonsense approach. Easily replaced if someone was stupid. No drama. But for having them work properly , first remove the shoulders. No big deal. The Vics are 4116 I believe, and a bit coarser than forged Zwilling or Wüsthof. Much more abrasion resistant than the SAKs. Maybe. I just measured three 1980’s era Henckles 4-star, two 8-inch and a 10-inch, that have been sharpened over the years but not intentionally thinned. They measured just under .6 mm immediately behind the edge at midblade. With a Cordon Bleu I found 0.35mm and could reduce it under the 0.3 be easing the shoulders. So at least you won't crack but cut your carrots. That’s why I start sharpening behind the bevel, thinning a bit every time. In the eighties the Wüsthof came with a convexed edge. Today it's a straight one with very pronounced shoulders, and a very edge the steel doesn't take or hold. Cheaper production and a lot of marketing. Once the shoulders are taken off and the very edge is slightly rounded they become usable again. No. 0.6mm is way too fat. If you reduce it, with a convex bevel in line with the blade's face, to say 0.4mm you will see a huge improvement. Which brings me to the OP's question. 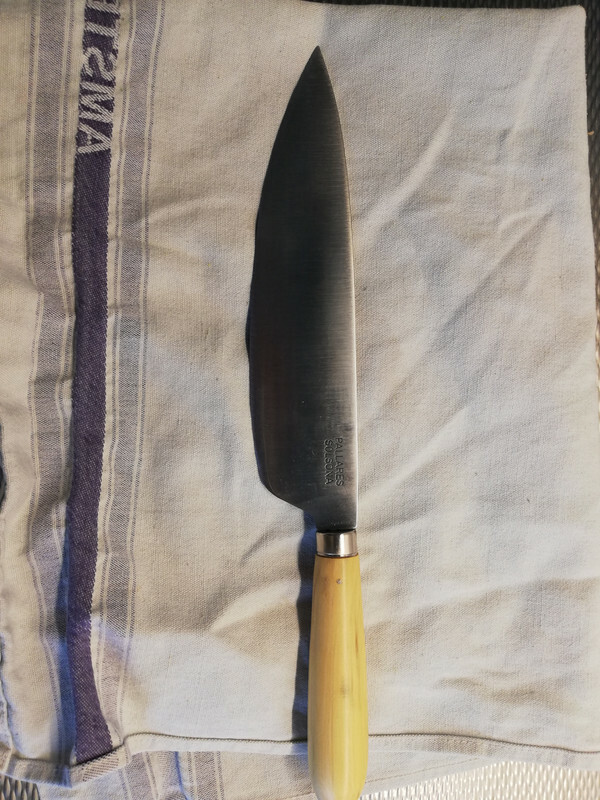 For about €40 you may get a carbon steel 22cm chef's, made of the simplest steel in the world, C60, hardened at its max, 60Rc. Carbon steel sharpens very easily, is finely grained and is superior in sharpness to any other. First weeks of use in a home environment, or first days in a pro, you should make sure to clean it immediately after use, by rinsing with the hottest water, wipe it off and let it air dry before putting away. This one isn't the thinnest, but clearly convexed. Almost no bevel. Excellent performer, blowing away any soft stainless. The Pallarès Solsona from Spain. Basic, but very well made.